By clicking the Browse Filestore button in the Save Table window, you can obtain a browser which will display the files in a given directory. The browser can display files in remote filestores such as on MySpace or SRB servers; see the section on the load filestore browser (Appendix A.6.1) for details. To save to an existing file, select the file name and click the OK button at the bottom; this will overwrite that file. To save to a new file, type it into the File Name field; this will save the table under that name into the directory which is displayed. 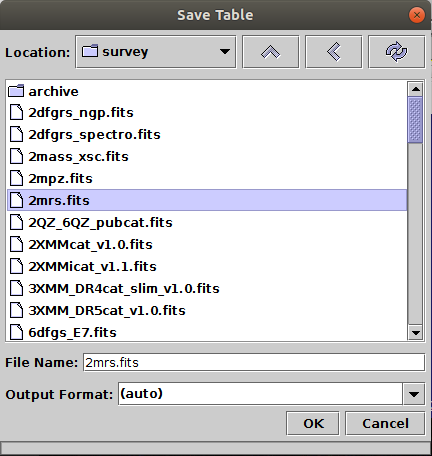 You can (re)set the format in which the file will be written using the Output Format selector box on the right (see Section 4.1.2 for discussion of output formats).